Sure, 2007 still has a ways to go, but we've already reached a critical moment in what newly minted Nobel Prize winner Al Gore has called the "moral and spiritual challenge to all of humanity." Yes, global warming is a challenge to all of humanity, but meeting it starts with each and every one of us as individuals. And right now, you can do something that will make a huge difference. The U.S. Congress must pass an energy bill. This time around, though, they have a chance to pass one that actually will make a real difference in stopping global warming. It's simple: We need a bill that raises fuel-efficiency standards while also adopting a renewable electricity standard. Both of these are on the table as the House and Senate work to reconcile their competing versions of the bill. And if we can get both in this bill, we'll eliminate 20 percent of our global warming emissions by 2030 and make significant progress on long-term reductions in global warming pollution. And get this: Doing your part won't win you any prizes, but it will make America stronger, create jobs, and save you money. Check out our updated "I Want My MPG" calculator to see exactly what a 35-mpg fuel-efficiency standard could save you every year. 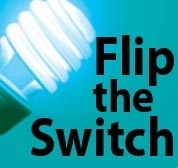 Then, tell Congress it's time to "Flip the Switch" by signing our petition to the House and Senate leadership. Because this is one fight we have to win.